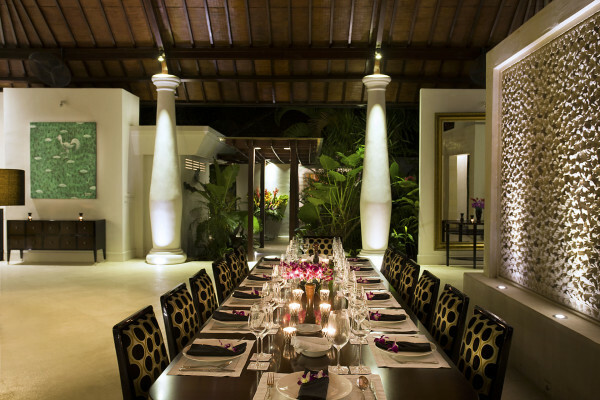 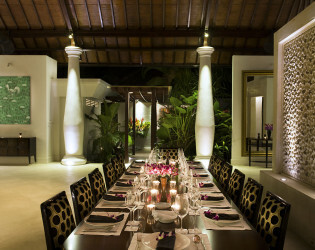 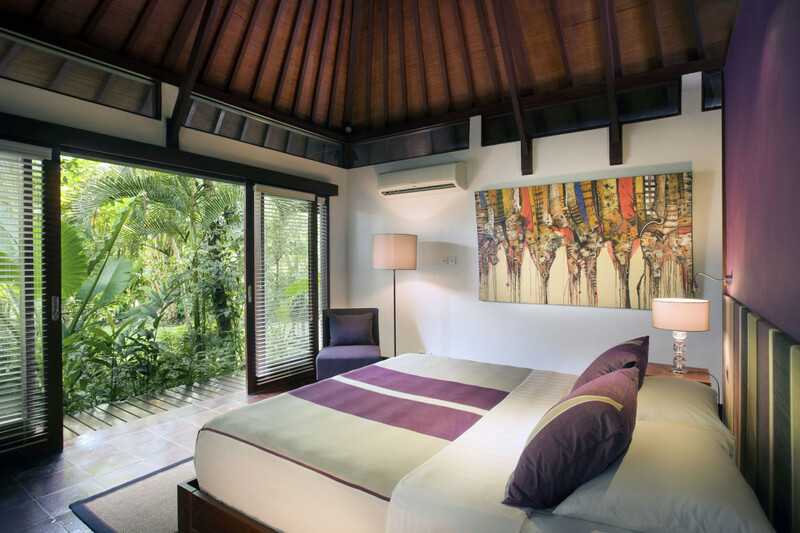 Total luxury awaits you at this Balinese estate. Discover a tropical paradise while living it up at this superb 7-bedroom riverfront hideaway. 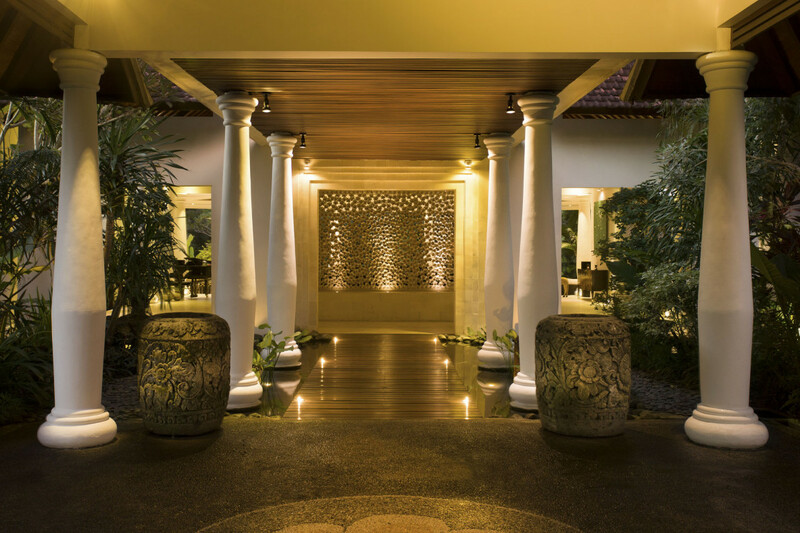 Everything from the sprawling grounds to the private gourmet chef makes this the only way to explore foreign land with class, comfort, and style. 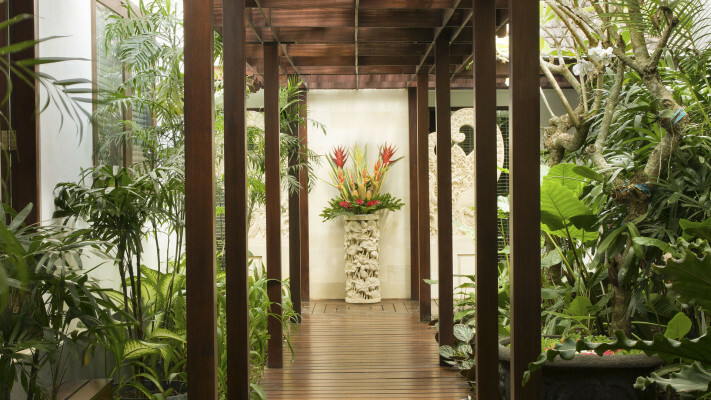 Arrive at the Porte Cochere and walk-through the entry colonnade and behold the breathtaking Main Bale, with formal dining and lounges overlooking the Penet River and onto the tropical jungle beyond. 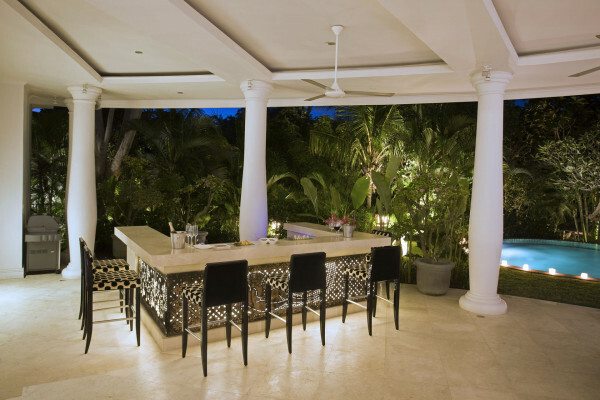 Sweeping stairs down to the Apron Terrace with casual dining and living - take a seat at the superb illuminated bar and enjoy a canapé created by your own private gourmet chef. Only a few steps to the Main Bale Pool’s edge set in the lush tropical landscape, with over an acre of gardens, terraces, and secluded dining bales, commanding views of the riverfront. 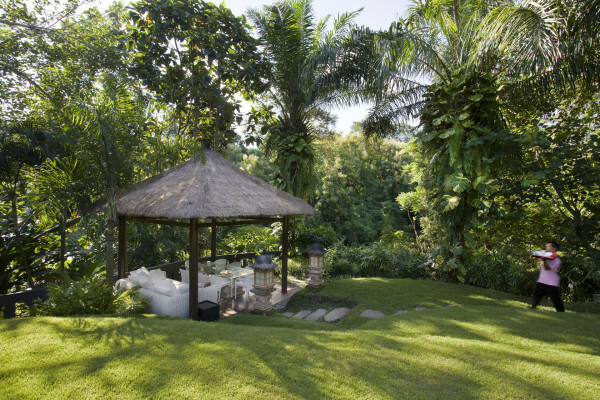 Wander through the tropical gardens to discover a superb entertaining bale and an infinity swimming pool surrounded by frangipani trees. 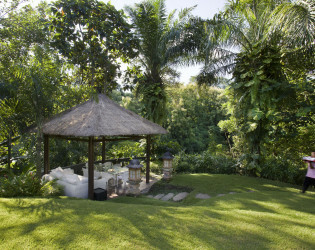 The Riverside Bale is perched in the lower garden overlooking the Penet River. 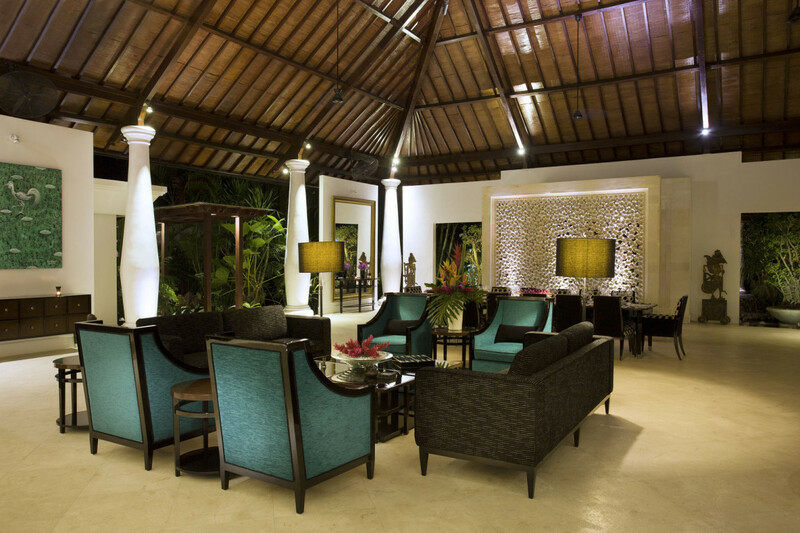 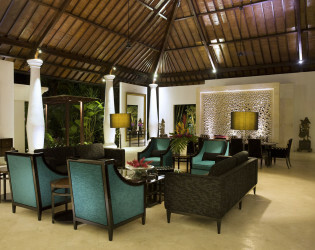 The perfect location for your a la carte breakfast, lounging with coffee and a good book, or casual drinks at sunset. 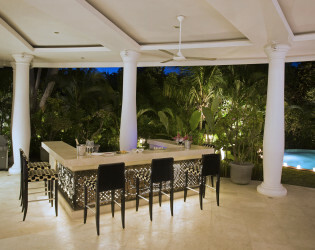 The casual living Apron Terrace opens onto the Main Bale poolside and offers casual dining for 14, sumptuous lounge seating and of course, the bar. 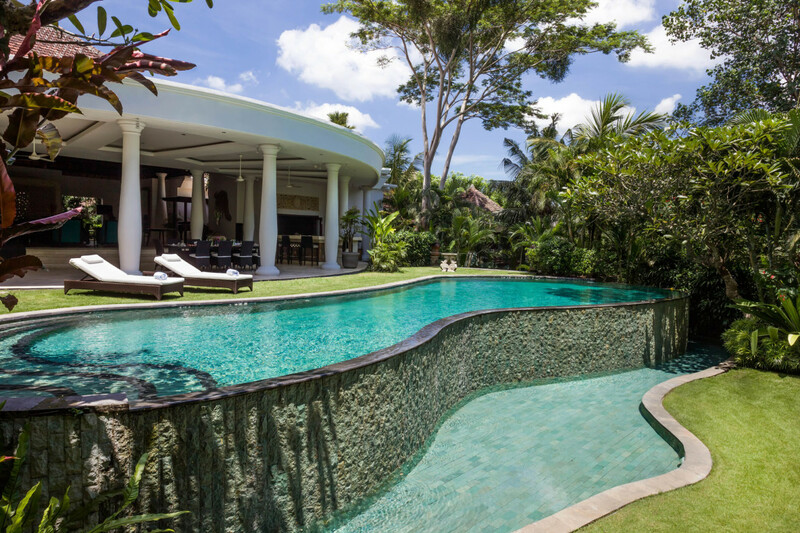 The perfect daytime place to swim or lounge by the Main Bale Pool. 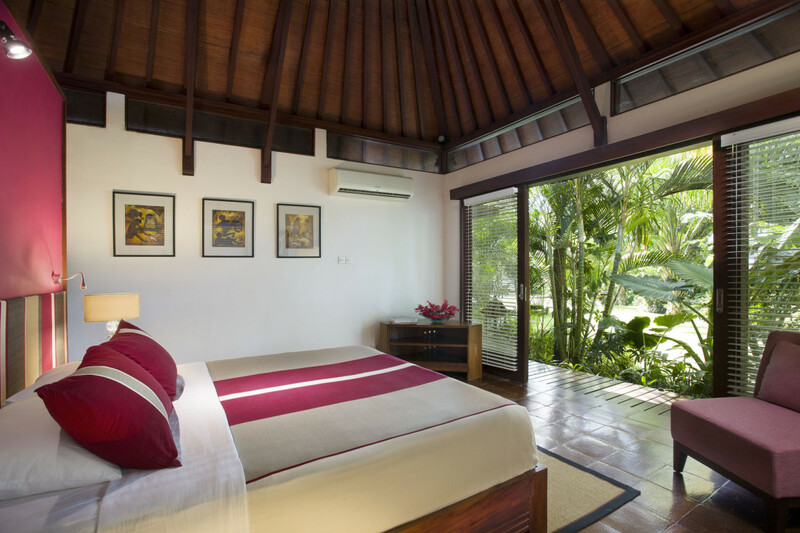 The master suite is set in a private wing with an elevated veranda and total privacy. 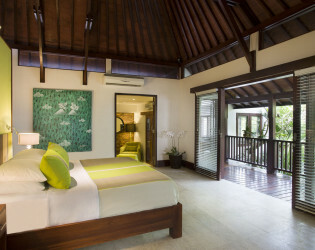 Adjoining is also a full dressing room and access to the Executive Office suite. 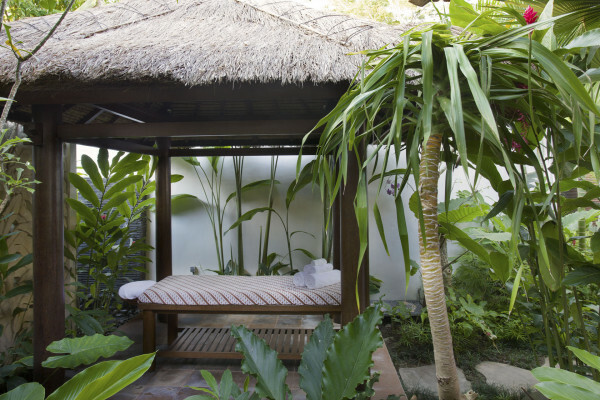 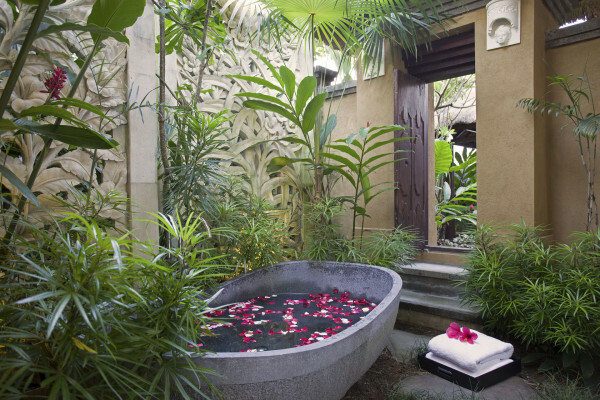 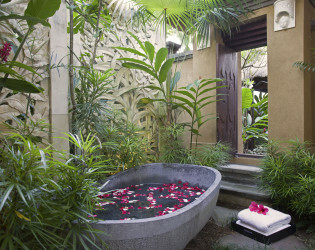 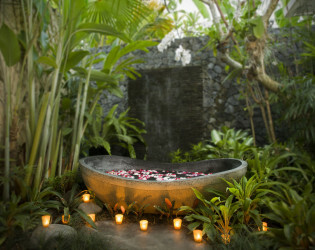 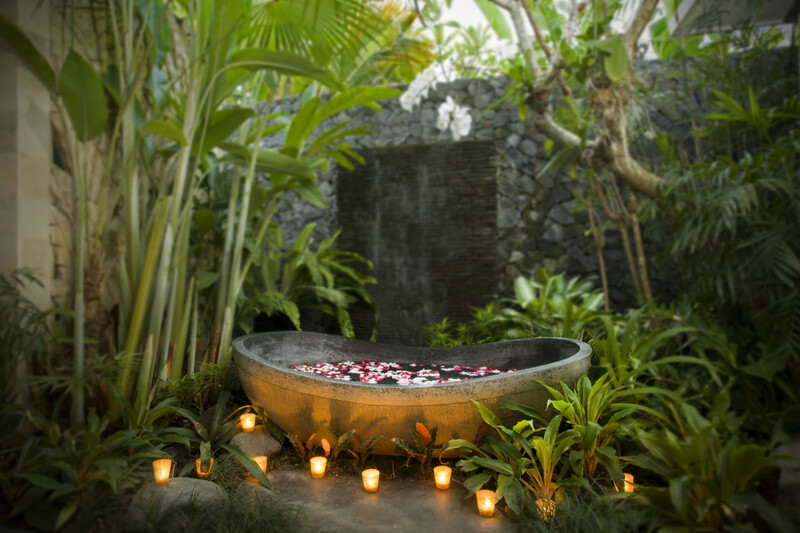 Linked to the massage bale through a ceremonial doorway, this beautiful suite has a large ensuite opening into a private garden with outdoor bath. 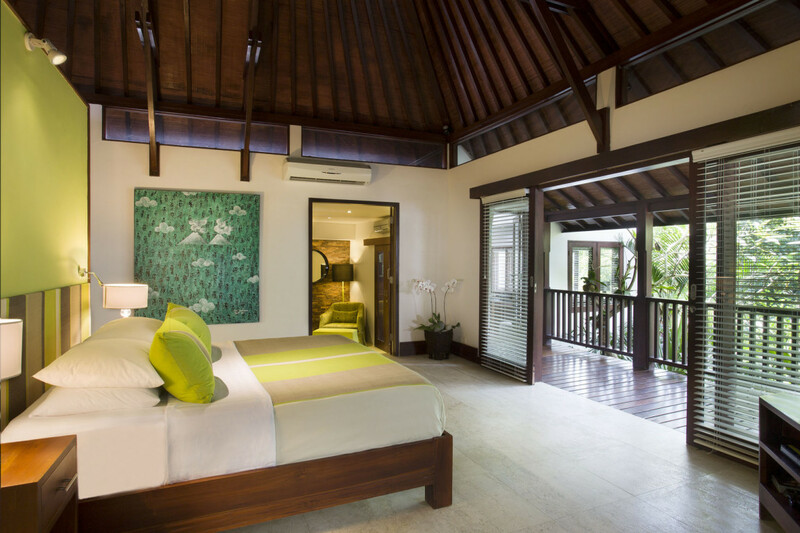 This beautiful suite looks onto the side garden and temple garden. This beautiful suite looks onto the side garden and entry gardens. 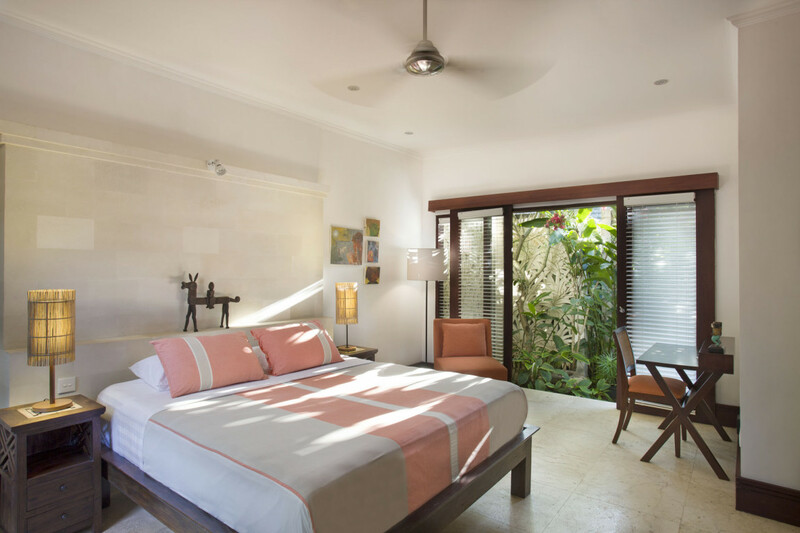 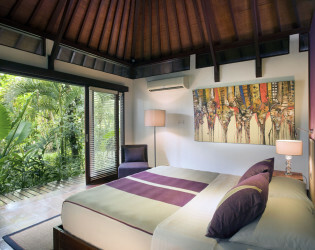 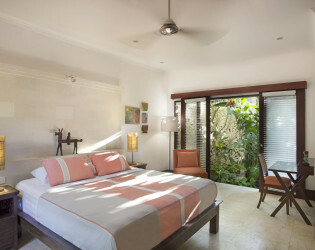 The large bedroom suite is tranquil and beautiful, with a privacy wall leading to a luxurious indoor / outdoor bathroom, with bathtub set in a tropical garden. 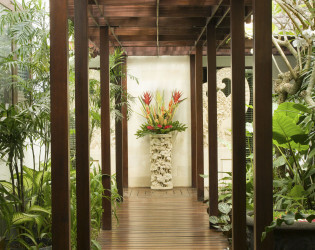 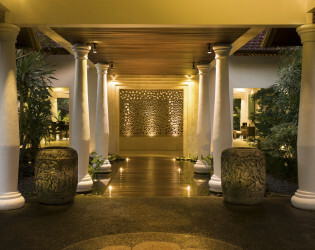 This beautiful entry colonnade leads to the breathtaking Main Bale. 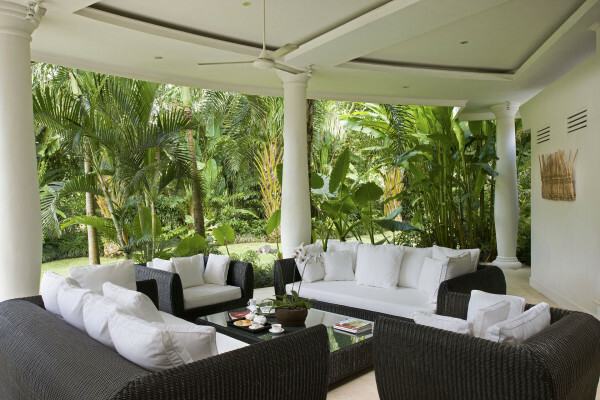 The Main Bale offers expansive formal dining for 14, and lounge areas, overlooking casual living and the swimming pool to the Penet River. 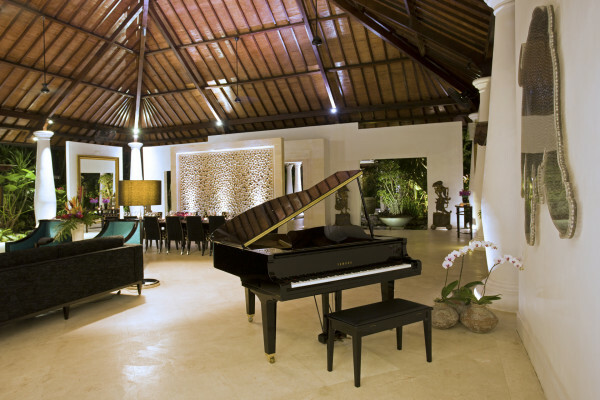 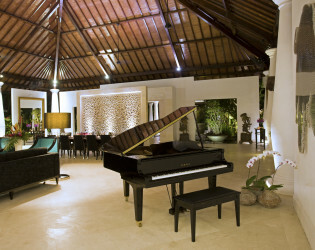 Sophisticated furnishings, grand piano and a collection of art and sculpture create an atmosphere of absolute luxe. Glamour at any time with your barman at hand – perfect for evening canapés and a cocktail before dinner – or a relaxing drink in the pool.